New release: Spy Vibers, are you ready for some exciting news? 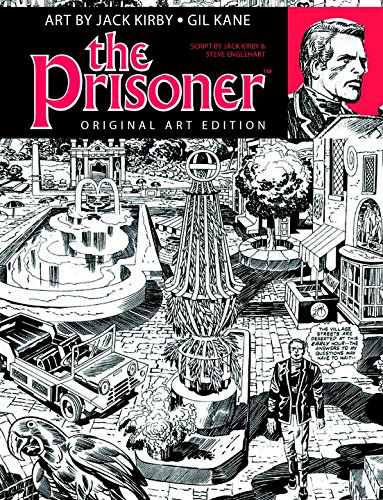 Amazon and The Unmutual have announced the upcoming release of The Prisoner Jack Kirby Gil Kane Artist Edition! The book will include original artwork based on Patrick McGoohan's classic series, The Prisoner. Both Kirby and Kane, prominent comic book artists, developed projects in the 1970s for Prisoner comics that remained unpublished. Fans have hoped for decades to see more examples and now Titan Books promises to deliver a collection scanned from the artists' original pages. Publication is set for March, 2018 (on the 6th- of course!). Stay tuned for updates as more info is released. In other news, my episodes of the Cocktail Nation radio show from Australia are now live: Episode #1(Danger Man) and Episode #2 (The 10th Victim), Epsiode #3 (On Her Majesty's Secret Service) Episode #4 (Roger Moore/The Saint), Episode #5 (The Avengers). And coming soon- Episode #6 (The Prisoner). Enjoy! Related posts: Review: The Prisoner Vol 2, Interview: The Prisoner Guide, Portmeirion Photography 1, Portmeirion Photography, The Prisoner London Flat, Alan Hayes Prisoner Audio Review, Interview: Ian Olgivy, Interview: Brian Gorman, Prisoner Supergrass, Prisoner XTC, Prisoner XTC 2, Prisoner DC Fontana. Selected Spy Vibe Posts: Review: The Prisoner Vol 2, Interview: The Prisoner Essential Guide, Maud Russell Mottisfont, Spy Vibe Radio 4, Batman Gallants, Adam West R.I.P., Village Triangle, Roger Moore R.I.P., Spy Vibe Radio 3, Sgt Pepper 50th, Satanik Kriminal OST, 60s Overdrive, Make Love in London, Spy Vibe Radio 2, Spy Vibe Radio 1, James Bond Strips, Propaganda Mabuse, Interview: Police Surgeon, XTC Avengers, 1966 Pep Spies, Batman Book Interview, Exclusive Fleming Interview, Avengers Comic Strips, Robert Vaughn RIP, UNCLE Fashions, Thunderbirds Are Pop!, Interview:Spy Film Guide, Lost Avengers Found, The Callan File, Mission Impossible 50th, Green Hornet 50th, Star Trek 50th, Portmeirion Photography 1, Filming the Prisoner, Gaiman McGinnins Project, Ian Fleming Grave, Revolver at 50, Karen Romanko Interview, Mod Tales 2, Umbrella Man: Patrick Macnee, New Beatles Film, The Curious Camera, Esterel Fashion 1966, Exclusive Ian Ogilvy Interview, 007 Tribute Covers, The Phantom Avon novels return, Ian Fleming Festival, Argoman Design, Sylvia Anderson R.I.P., Ken Adam R.I.P., George Martin R.I.P., The New Avengers Comics, Trina Robbins Interview, The Phantom at 80, 007 Manga, Avengerworld Book, Diana Rigg Auto Show, The Prisoner Audio Drama Review. Englehart says his version was done before Kirby had his turn, yet other sources say Marvel turned to Steve and Gil only after rejecting Jack's version. I have no inside info to suggest which story is accurate, but someone who was actually a participant in the proceedings has to be given some weight. Either way, I'd bet a great deal Kirby never saw the other attempt before or after doing his own. While I'm a big fan of Englehart's work it's no secret I'm an even bigger fan of Kirby, and I think Jack does a better job of capturing the tone of the original series in his adaptation. YMMV! Thanks, Mim and Richard! This really does look cool. And as Richard notes, it will be interesting to see if the Kirby and Kane book includes more about the timing and details of both comic projects.